Born 5 September 1875 in Millom, Cumberland [registered in Bootle, December 1875]. Birthdate confirmed by the 1939 register. According to the 1881 census, James is the youngest of four children, to the widowed Hannah, living at 103 Wellington Street in Millom. His father, Stephen, died in the first quarter of 1881. According to the 1891 census, James remains the youngest of the four children still living at home with their mother at living at 12 Huxley Street in Halliwell. He is a tenter at the bleachworks. According to the 1901 census, James is a professional footballer married to Catherine and they have two children, John and Bertha. They also have one servant and they live at 18 Eton Street in the Walton-on-the-Hill area in Liverpool, opposite Goodison Park stadium. According to the 1911 census, James and Catherine are running the Dog & Partridge on the Moor Lane in Bolton. The census reveals that one of their four children had died. According to the 1939 register, widowed Jamesis an Iron Foundary Labourer, living at 6 Bottom of Moor Old Lane in Horwich with his son, James, and his wife, Minnie. Married: to Catherine Leigh Higham, on 23 May 1898 at St. Elizabeth of Hungary Church in Aspull [registered in Wigan, June 1898]. Died in 1926. Died: 1 June 1954, aged 78 years 269 days [registered in Farnworth, June 1954]. Living at 102 Chorley New Road, Horwich. Buried on 5 June 1954 at St. Peter's Church, Halliwell, with his wife and two of his children, Robert and Bertha (left, photo courtesy of gravestone-photos). Height/Weight: 5' 6", 11st. 0lbs . Club(s) Played junior football in Bolton before joining Bolton Wanderes FC in 1894 and made thirteen league appearances, scoring four goals. Joined Halliwell Rovers FC a year later and transfrerred to Bury FC in January 1897. After 28 goals in 63 league outings, Everton FC spent £400 on him on 13 April 1899. Becoming club captain. He made 237 league appearances and scored 84 goals. 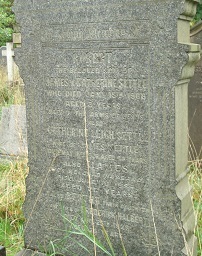 On 12 May 1908, Settle joined Stockport County FC, scored twice in 26 league outings, retiring a year later. Player number One of four who became 242nd player (244) to appear for England. First match No. 65, 18 February 1899, England 13 Ireland 2, a British Championship match at Roker Park Ground, Association Road, Monkwearmouth, Sunderland, aged 23 years 166 days. Last match No. 77, 14 February 1903, England 4 Ireland 0, a British Championship match at Molineux, Wolverhampton, aged 27 years 162 days. No additional information, but we know from census records that he became a publican. - An English Football Internationalists' Who's Who. Douglas Lamming (1990). Hatton Press, p.219.